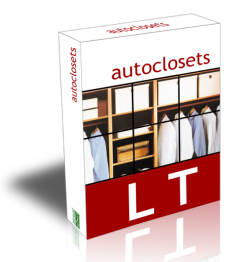 autoclosets - Products :: autoclosets LT 8.0 for Windows main features, easy and affordable 2D/3D closet design software. autoclosets® LT 8.0 has been developed to cover the needs of fitted wardrobe sales teams by generating 3D photorealistic images, plans and quotes in just a few minutes. autoclosets® allows the user to modify internal spaces and move or erase elements like drawers, shelves, fillers, dividers and hanging rails in a very easy and accurate way. It controls the position of these elements according to any prefixed holes and assures that the wardrobe design is adapted to the manufacturer's specifications. Very easy to use and learn. Fast: design and quote fitted wardrobes in minutes. Reliable: It controls the position of the elements according to any prefixed holes and assures that the wardrobe design is adapted to the manufacturer's specifications. It automatically generates top and elevation plans with all the spaces dimensions and photorealistic 3D images. Type (model): The designer starts by choosing the number of modules. Next they decide on the type of doors according to the way they open, models and mouldings. Each door model can have multiple materials and finishes. The finish for the interior, mouldings and side panels can be selected separately. 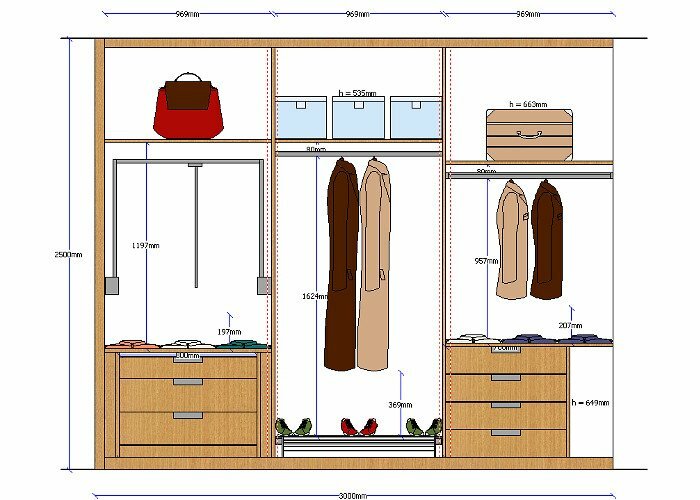 Architecture and Obstacles: The Designer will indicate the architectural space in which the wardrobe will be fitted and the position according to the walls. The front can be aligned to one or two walls, one or two end panels etc. and as a result it is very easy to select the correct type of Scribes, returns or panels. The designer can also insert any pillars or beams that will affect the design. Doors and spaces: With the data entered, autoclosets® calculates the usable space according to the modules and architecture selected, it calculates the width and depth of each one of the modules, and these can be changed individually. The designer can also choose the number of doors, distribution, number of panels, finishes and frame materials. The program will show any changes in real time on your screen. Structure: The designer can insert the top shelves and dividers. Designers can also modify the module sizes individually and apply the relevant modifications to be adapted to obstacles, such as boxing or modifying the width to be aligned with a pillar. Distribution: At this stage autoclosets® displays the dimensions all of the spaces available to help the designer with the distribution of drawers, fillers, shelves, hanging rails, dividers etc. All these elements are inserted according to the manufacturer specifications automatically. For example to move a shelf is as easy as clicking on it and use the up-down arrows on your keyboard. The shelf will move according to the available holes. Any changes on the finishes for shelves, drawers etc are shown in real time in your screen. autoclosets® LT 8.0 will automatically generate photorealistic images in 3D, as well as top and elevation plans with all the spaces' dimensions, distances between shelves, drawer heights, hanging rail elevation etc. In elevation plans autoclosets® LT 8.0 also shows any collision areas for the drawers with doors and mouldings. autoclosets® LT 8.0 includes several catalogues with all the required specifications for the design of the wardrobe. The Universal Catalogue includes multiple doors models, drawers, dividers, shelves accessories etc. It has more than 30 parameters that affect the structure, mouldings and doors. These parameters can be modified by users to adapt the wardrobe to their needs. autoclosets® LT 8.0 will produce a quote for the wardrobe according to the design. The prices are grouped by doors, interiors and accessories and different ranges can be quoted from only one design. autoclosets® LT 8.0 includes a price calculator for the user to customise how the program will calculate prices. In the autoclosets® LT 8.0 screen the designer can instantly create a 3D photorealistic image of the wardrobe with or without doors. With the help of the mouse the designer can move the camera position in real time as well as zooming in and out. The 3D visualization of the wardrobe will help customers choose their finishes, increasing their confidence and accelerating their decisions. As you work with a universal catalog, you have to enter the prices in the program with the Price Editor that comes with autoclosets® LT. Then you will get a price quote automatically. The program comes with a software-lock key that is activated with the code that is provided with the program. Users who need to run autoclosets® LT in more than one computer at the same time need to purchase additional licenses. To use the same program in two different computers at different times (i.e., laptop and desktop) the software-lock key needs to be moved from one computer to the other. Small improvements are periodically available via Internet. In terms of upgrades to new versions, there is likely to be an upgrade every 12. Upgrade prices are available on the Website. The program delivery is done by email. It includes a link to download the installation file and the license number to activate the software-key. Link to download the program. Currently, autoclosets® is not compatible with MAC. You can check the system requirements on this Website. The supported operating systems are Windows® 2000, XP, Vista 32bit and Windows® 7. 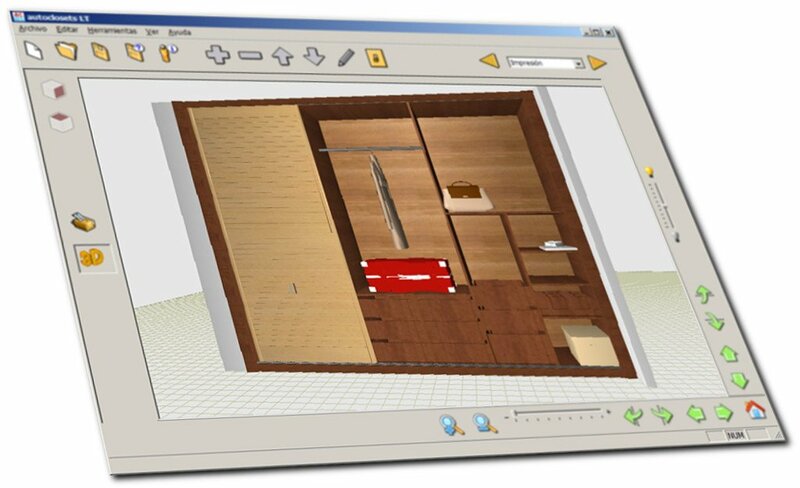 Mac users can design closets and fitted wardrobes with Quick3DPlan® and its optional module for closet design.